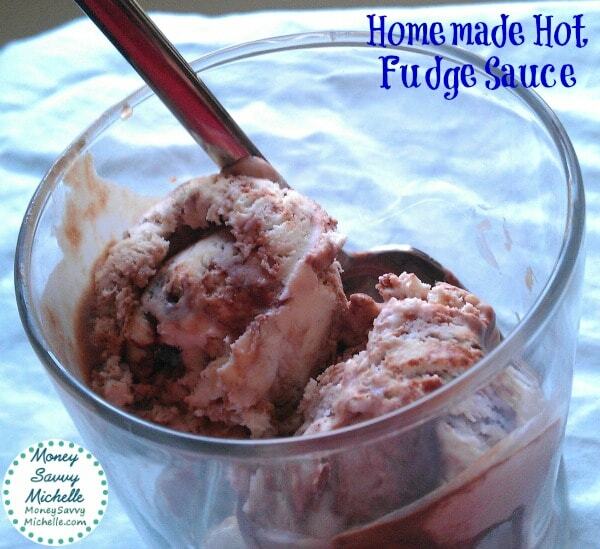 This homemade hot fudge sauce recipe is the perfect topping for all those summer sundaes! Earlier this week I posted the Homemade Vanilla Fudge Swirl Ice Cream recipe (no ice cream maker needed) that he requested to go with marble cake for his birthday dessert. A few months ago, I posted our new favorite homemade ice cream recipe that takes just 3 ingredients and requires no ice cream maker – the one the boyfriend said was the best ice cream he’d ever had. So, I pondered what ice cream would go best with marble cake? A marble-like ice cream, or vanilla fudge swirl ice cream, of course! The next step was to come up with a homemade hot fudge sauce recipe. Even though we had a jar of hot fudge topping in the fridge for those lazy nights, I of course wanted to make something extra special since it would be for a birthday. However, for this chocolate vanilla swirl ice cream recipe, you could totally use store bought hot fudge for a tasty and quick ice cream recipe. This hot fudge recipe is actually really easy and quick to make, though. The hardest part is allowing the sauce to sit and cool to thicken up without sticking a spoon (or totally guilty of a finger here – we share each others cooties daily after all ;) in for a taste. The thing I really liked about this homemade hot fudge sauce recipe is that it has a nice deep chocolate flavor without being overly sweet. I, of course, don’t mind super sweet chocolate, but the boyfriend isn’t a fan of sugary sweet desserts – he didn’t even want frosting on his cake, after all! We both really loved the resulting homemade hot fudge. I think this recipe would not only be good over or in ice cream, but also in cakes for an extra punch of chocolate (which I did for the marble section of the cake), coffee for a mocha, or to use as a hot chocolate base. 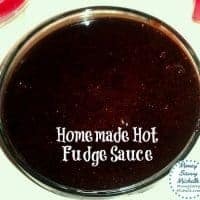 This Homemade Hot Fudge Sauce Recipe is great over ice cream or to give an extra chocolate boost to cakes, cookies, cupcakes, hot cococa, etc.! Whisk together the sugar, corn syrup, water, cocoa powder and salt in a medium saucepan over medium heat. Continue to constantly whisk over medium heat until mixture starts to bubble and then comes to a low boil. Once at a low boil, allow mixture to cook for 1 minute, whisking thoroughly every 15 seconds or so. After 1 minute, remove the pan from heat and stir in the vanilla. Let mixture cool a few minutes to thicken more if desired, or let cool in the fridge before using in an ice cream recipe. 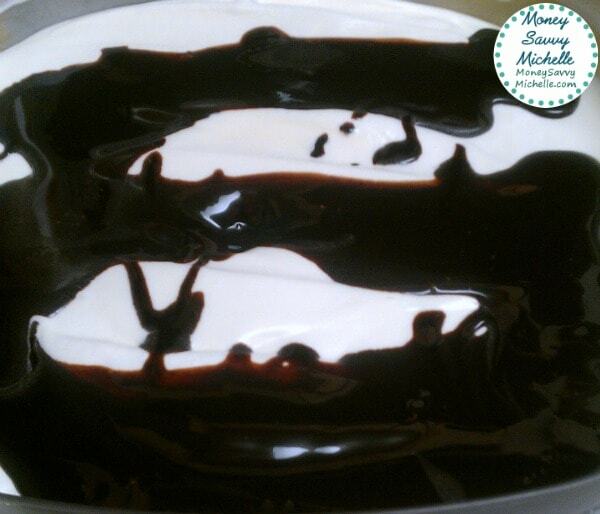 Hot fudge sauce can be stored for up to 2 weeks in a refrigerated covered container. Recipe adapted from The Perfect Scoop by David Lebovitz. 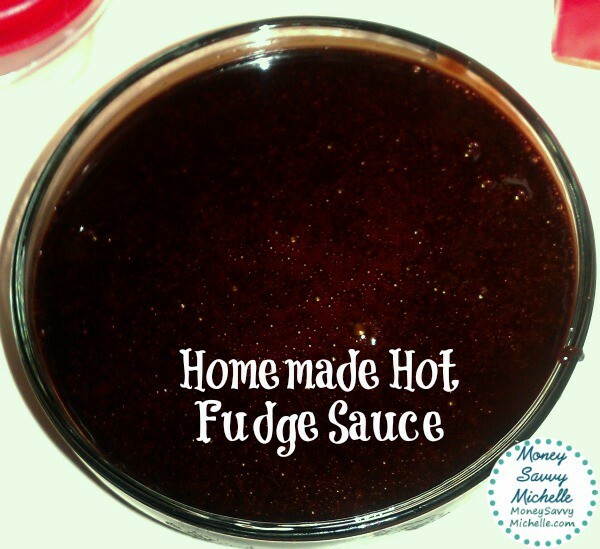 I hope you enjoy this homemade hot fudge sauce recipe – be sure to check out our homemade ice cream recipes to go with it!